Industrial Brushes Industrial brushes are bristled cleaning, painting, finishing and machining tools. A brush is the combination of bristles and a holding piece on which the bristles are mounted. The composition and shape of both as well as their relationship to each other determine the brush's function. 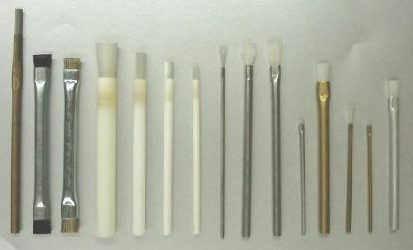 Because of the great diversity of contexts in which industrial brushes are used, an equally great diversity of brushes is necessary to accommodate them. Brushes vary in their shape, size, bristle material and in many other respects. Wheel brushes, for example, are very different from artist brushes. 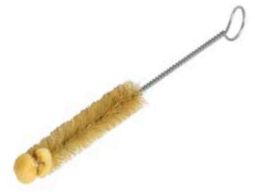 Wheel brushes can feature wire or nylon bristles set in and situated around a circular ring. That ring is usually attachable to a motorized wand or other tool that causes the brush to spin. Such brushes are often used in finishing, deburring and other industrial surface treatment applications. Artist brushes are almost always hand-held, soft-bristled, small brushes used for the careful application of paint and stains to surfaces. They can also be used for the careful cleaning of delicate equipment and even archeological discoveries. Brooms, mops, block scrubbers and wire scratch brushes are used in maintenance, parts cleaning and janitorial services. Sweeper brushes, power brushes and other larger brush varieties are applied in more heavy-duty applications. Sweeper brushes, for example, are used in small vacuum cleaners, hard floor buffers and even street sweepers. Power brushes are used in manufacturing and fabrication for deburring and other machining processes. The variety of bristles defines the use of a brush, as is exemplified by a paintbrush that is composed of soft nylon fibers mounted in a clamped metal ring affixed to a wooden handle. This is ideal for delicate cleaning and paint application. It is easily hand-held, allows for very precise and controlled movement and will not abrade or otherwise damage a surface. However, such a brush configuration would not be useful in rigorous cleaning or surface treatment applications; mounting metal or stiff plastic bristles horizontally on a small wooden handle would make applying the force necessary to effectively clean a surface difficult for most people. Instead, cleaning brushes and other similar brushes are mounted on handles that give their users move leverage, making their use much easier and more effective. Wheel brushes must be precisely manufactured in terms of their means of attachment to motors and in terms of their bristle composition, and the same is true for sweepers. In both cases, the bristles must be capable of adequately treating a surface without damaging it. They must also be durable enough to function effectively without degrading or becoming dislodged.